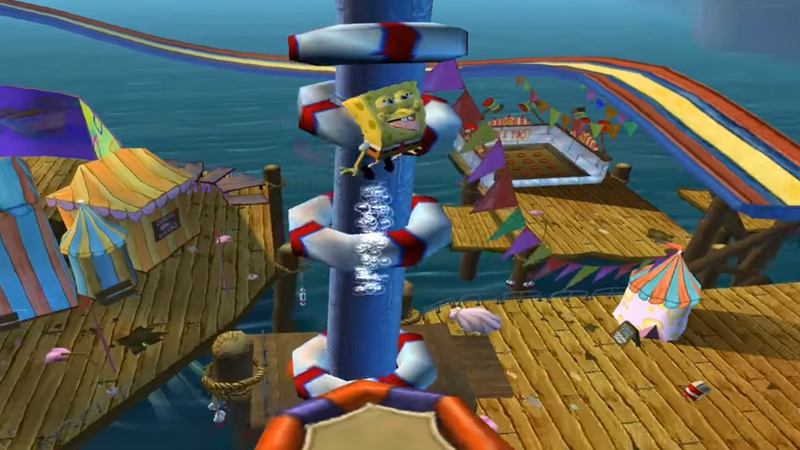 SpongeBob SquarePants: Battle for Bikini Bottom is a forgettable 3D platformer from the early 2000s that’s nevertheless gained a small cult following in recent years thanks to a dedicated speedrunning community. Now, a glitch discovered just a few days ago that allows players to infinitely farm one of the game’s collectibles threatens all that. The goal in Battle for Bikini Bottom is to traverse levels while collecting various items like spatulas and “shiny objects” to unlock other levels and do the same thing there until the game’s over. Along the way is Goo Lagoon Pier, where there’s a skeeball machine that awards shiny objects for scoring points. For several years some players have speculated it might be possible to glitch the machine and farm more shiny objects from it faster. On October 1, a tool-assisted-speedrunner (TAS) who goes by FusionVaria on Twitter tried to investigate the skeeball machine in depth using a level viewer mod called Industrial Park. They were able to see the exact shape of the trigger that decides whether or not the player scores points. They elicited help from the rest of the community to dive into the game’s code and find out whether there was a limit to how often it could be activated. Players spent the night experimenting, and by the following morning they’d discovered how to use SpongeBob to get the ball situated in such a way that it the trigger would activate 30 times a second, or once every other frame. “As a result of the unprecedented rate this collects shiny objects, it will save massive time in 100% speedruns. replacing the old and slow grinding method. Potentially this will completely change any% speedruns as well,” FusionVaria said in an email. “Because there are 8 Mr Krabs spatulas, which can now be bought quickly using 39500 skee-ball-generated shiny objects, we have 8 newly fast spatulas in the earlier half of an any% speedrun to work into the route.” 75 spatulas total, used to unlock new levels, are needed to finish the game so being able to buy 8 of them outright completely disrupts the optimized and elegant flow of previous speedruns. Basically, this renders obsolete all those perfect, impressive routes through the game that had been optimized by speedrunners for years. Shift, the game’s Michael Jordan, had set another world record in the game literally just the day before. Now it runs the risk of being tossed in the dustbin as people blow past it in runs utilizing the new, less consistent but still much easier to pull off shiny object farming trick. As a result, there have been emergency discussions of sorts over the past few days about how best to reorganize the game’s leaderboards in order to account for this new exploit, which is now being called Skee Ball Abuse or SBA for short. “Everyone agrees the skee-ball trick should be banned from the competitive category,” Shift told Kotaku on Discord. The alternative would be to allow SBA and potentially ruin the game’s speedrunning scene. “Most people would be running almost the same route if this happened, which makes the game even more bland.” It’s the equivalent of a highway opening up that makes the afternoon commute slightly faster but requires spending more of it in traffic. Three solutions currently being debated include making a separate category for runs that utilize SBA, combining the records under the same heading but adding “SBA” to the ones that use it, or blowing up the main competitive category altogether by bringing back in runs that use the game’s menu for entering official cheat codes. Shift favors the latter, a fundamental change in his philosophy regarding Battle for Bikini Bottom speedrunning. “I feel it is objectively true that in-game codes are in the game, and restricting them makes it not true any% in that case,” he said. “To be fair though I was against that position until this trick was found but reconsidering what makes a category arbitrary or not, I’m for it now.” In other words, if the game’s speedrunning community is going to arbitrarily allow SBA but still try to cordon it off from the “true” runs, they might as well do the same for “cheat” runs where codes make it possible to finish the game in under two minutes since, in the spirit of speedrunning, they are truly the fastest runs. In the end the majority of the community agreed during a livestreamed discussion on the matter that took place last night. The game’s leaderboard mods agreed and the speedruns.com page has been updated to reflect the community’s new epistemology and its desire to preserve the game’s competitive speedrunning beauty.